There are so many Italian recipes that include cheese, especially those that are baked stuffed noodles. This makes it challenging for a vegan to enjoy these types of traditional dishes as most include ricotta cheese. Luckily, this recipe for manicotti uses tofu in place of the ricotta cheese, ideal since both ricotta and tofu are very mild in flavor, creating a similar texture and taste. The tofu "cheese" filling includes garlic, soy milk, olive oil, lemon juice, and parsley, making a fresh tasting filling that no one may suspect is vegan. Prepare the manicotti according to package directions. Drain and rinse the noodles; gently pat dry. In a large mixing bowl, stir together the mashed tofu, garlic, soy milk, olive oil, lemon juice, sugar, salt, pepper, parsley, and spinach, if using. Spread a 9x13-inch baking pan with 2 cups of the spaghetti sauce. Gently spoon the tofu mixture into each manicotti until they are all full. Place the filled manicotti noodles in one layer on top of the spaghetti sauce. Pour the remaining 2 cups spaghetti sauce over the stuffed noodles. Cover the pan tightly with aluminum foil and bake for 30 minutes, or until the sauce bubbles. If you would like a bit more flavor in your manicotti filling, try this vegan ricotta cheese substitute which is similar to the filling in this recipe but with a few more ingredients. Whether you are making stuffed shells or lasagna (such as a low-fat vegan eggplant lasagna), the vegan ricotta substitute is great to have on hand in the fridge. If you would like to make this vegan manicotti ahead of time, you can prepare it the night before and place in the refrigerator until ready to bake. It can also be frozen; just keep in mind the tofu may change its texture a little bit as it can get chewier when cooked after being frozen. 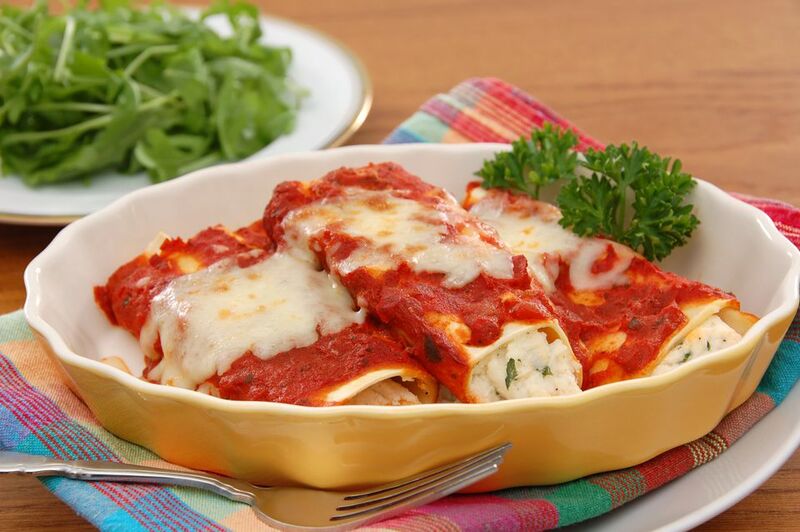 Although manicotti is traditionally a dish made just with noodles, cheese, and sauce, it is also a great vehicle for holding plenty of healthy vegetables. To add more nutrition and heft to this dish, fold some roasted vegetables into the tofu filling before stuffing the pasta tubes. It's super easy if you have leftover roasted vegetables, but if you don't, try eggplant, zucchini, mushrooms, and bell peppers. If you prefer a different shaped pasta, feel free to switch. This filling would also work well for stuffed shells or even baked ziti. If you are making baked ziti, mix the cooked pasta with the filling and then put the mixture in a baking dish and bake.